When your task list is entered, sequenced, and outlined in Microsoft Office Project 2003 (see Figure 5-1), you're ready to start the work of creating a schedule. Figure 5-1. 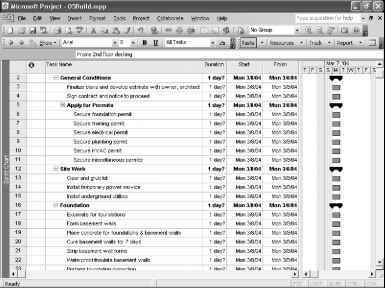 Your project schedule displays all tasks starting on the project start date, each with an estimated duration of 1 day. To create a realistic schedule, you can start by entering the amount of working time you believe each task will take to complete; that is, the task duration. 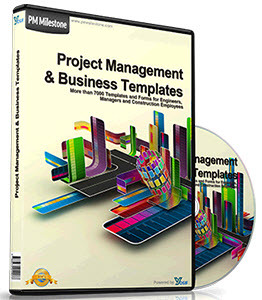 As soon as you enter a task, Project 2003 assigns it an estimated duration of 1 day, just to have something to draw in the Gantt chart. You can easily change that duration. 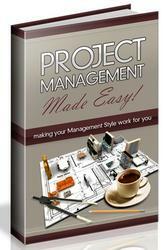 Entering accurate durations is very important for creating a reliable project schedule. Microsoft Project uses the duration of each task to calculate the start and finish dates for the g task. If you will be assigning resources, the duration is also the basis for the amount of work for each assigned resource.